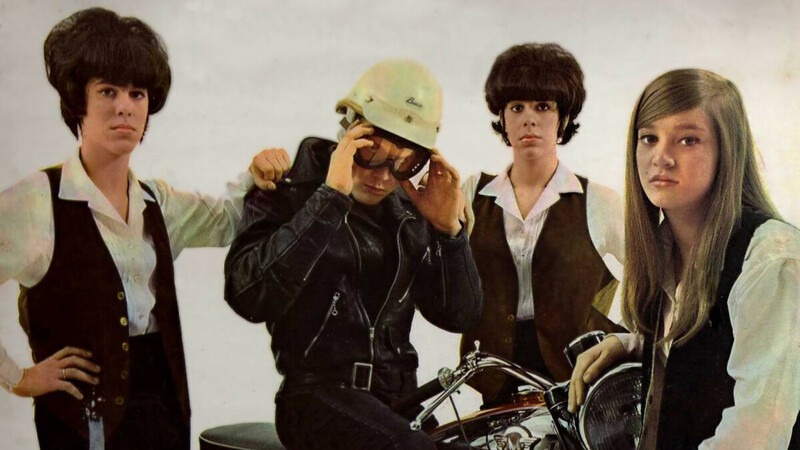 The Shangri-Las on the cover of the "Leader of the Pack" single. When record producer and songwriter George "Shadow" Morton died on Valentine's Day this year, he left behind a legacy as murky as his nickname, which he got from disappearing on long benders. At the time of his death, Ace Records in London was busy compiling a collection of his productions called Sophisticated Boom Boom: The Shadow Morton Story, which is out now. Morton was born in Virginia in 1941, but raised in Brooklyn. By the time he was 13, he'd gotten in enough trouble that his parents moved to Hicksville, on Long Island. It turned out that most of the teenagers there had arrived under similar circumstances, and in no time he was running with a gang — adopted by their leader, a biker named Bumpy. After graduating from high school, Morton hitchhiked across the country doing odd jobs, and one day, stranded in a snowstorm in Pennsylvania, he called a friend in New York. His friend came and picked him up, and on the drive back told him that Ellie Gaye was now known as Ellie Greenwich, and had written a bunch of hits. Morton finagled an invitation to her office, and they chatted, but he found he was irritating the other guy in the room — who turned out to be Ellie's husband, Jeff Barry. Barry asked him what he did, and Morton said he wrote songs, hit songs. Barry asked him to bring him one, and Morton said he would. Which would he prefer, fast or slow? Slow, Barry said. Morton said he'd be back on Tuesday. Morton found some musicians, then went looking for singers. Tony Giannattasio, from the Markeys, was now known as Tony Michaels, and had written songs for four girl singers who called themselves The Shangri-Las. Morton went to see them and booked studio time for that Sunday. He was so excited that when he showed up at the studio, he realized he'd forgotten to write a song, so he sat in his car until he'd come up with something. He walked into the studio, ignoring the howls of protest from the girls and his friend, went over to the 14-year-old piano player Billy Joel, and began to dictate a piano line. The next day, he went back to see Barry and Greenwich and handed them the tape. Barry disappeared with it and then came back to ask if he could play it for someone else. Morton said okay. The someone else Barry had played it for was Jerry Leiber, who recognized that Morton's teenage soap opera represented a step forward in teen pop — and, upon learning that Morton had written and produced it, offered him a job on the spot. He thanked them by remembering Bumpy and writing "Leader of the Pack" for The Shangri-Las. As a writer and producer for Leiber and Stoller's Red Bird Records, Morton kept the job for two years. But times were changing. Protest folk seemed like it was worth looking into, and next thing he knew, he'd found a 15-year-old girl, Janis Fink, playing in Greenwich Village. He had her change her last name and took her into the studio. Janis Ian's "Society's Child" did very well, considering its subject matter, and led to an appearance for her on a Leonard Bernstein TV special. The word was out: Shadow Morton was hot. Atlantic Records handed him Iron Butterfly, a West Coast band whose first album had flopped. Years of heavy drinking had worn him out, but he took the gig on and produced "In-A-Gadda-Da-Vida." With the dawn of the 1970s, Morton began working more erratically, producing the New York Dolls' second album in 1974 and then dropping from sight. Eventually, he went into the Betty Ford Clinic, dried out, and emerged into a quiet and reclusive life, writing music in his home in Laguna Beach, Calif., until his death.